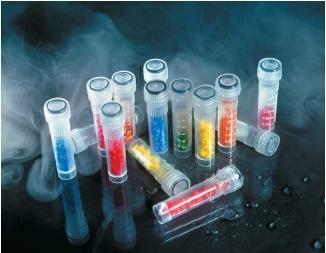 Cryogenics is the science of producing and studying low-temperature conditions. The word cryogenics comes from the Greek word cryos , meaning "cold," combined with a shortened form of the English verb "to generate." It has come to mean the generation of temperatures well below those of normal human experience. More specifically, a low-temperature environment is termed a cryogenic environment when the temperature range is below the point at which permanent gases begin to liquefy. Permanent gases are elements that normally exist in the gaseous state and were once believed impossible to liquefy. Among others, they include oxygen, nitrogen, hydrogen, and helium. The origin of cryogenics as a scientific discipline coincided with the discovery by nineteenth-century scientists that the permanent gases can be liquefied at exceedingly low temperatures. Consequently, the term "cryogenic" applies to temperatures from approximately −100°C (−148°F) down to absolute zero (the coldest point a material could reach). The temperature of any material—solid, liquid, or gas—is a measure of the energy it contains. That energy is due to various forms of motion among the atoms or molecules of which the material is made. A gas that consists of very rapidly moving molecules, for example, has a higher temperature than one with molecules that are moving more slowly. In 1848, English physicist William Thomson (later known as Lord Kelvin; 1824–1907) pointed out the possibility of having a material in which particles had ceased all forms of motion. The absence of all forms of motion would result in a complete absence of heat and temperature. Thomson defined that condition as absolute zero. Absolute zero: The lowest temperature possible at which all molecular motion ceases. It is equal to −273°C (−459°F). Kelvin temperature scale: A temperature scale based on absolute zero with a unit, called the kelvin, having the same size as a Celsius degree. Superconductivity: The ability of a material to conduct electricity without resistance. An electrical current in a superconductive ring will flow indefinitely if a low temperature (about −260°C) is maintained. Cryogenics, then, deals with producing and maintaining environments at temperatures below about 173 K.
One aspect of cryogenics involves the development of methods for producing and maintaining very low temperatures. Another aspect includes the study of the properties of materials at cryogenic temperatures. The mechanical and electrical properties of many materials change very dramatically when cooled to 100 K or lower. For example, rubber, most plastics, and some metals become exceedingly brittle. Also many metals and ceramics lose all resistance to the flow of electricity, a phenomenon called superconductivity. In addition, helium that is cooled to very nearly absolute zero (2.2 K) changes to a state known as superfluidity. In this state, helium can flow through exceedingly narrow passages with no friction. Cryogenics developed in the nineteenth century as a result of efforts by scientists to liquefy the permanent gases. One of the most successful of these scientists was English physicist Michael Faraday (1791–1867). By 1845, Faraday had managed to liquefy most permanent gases then known to exist. His procedure consisted of cooling the gas by immersion in a bath of ether and dry ice and then pressurizing the gas until it liquefied. Six gases, however, resisted every attempt at liquefaction and were known at the time as permanent gases. They were oxygen, hydrogen, nitrogen, carbon monoxide, methane, and nitric oxide. The noble gases—helium, neon, argon, krypton, and xenon—were yet to be discovered. Of the known permanent gases, oxygen and nitrogen (the primary constituents of air), received the most attention. For many years investigators labored to liquefy air. Finally, in 1877, Louis Cailletet (1832–1913) in France and Raoul Pictet (1846–1929) in Switzerland succeeded in producing the first droplets of liquid air. Then, in 1883, the first measurable quantity of liquid oxygen was produced by S. F. von Wroblewski (1845–1888) at the University of Krakow. Oxygen was found to liquefy at 90 K, and nitrogen at 77 K.
Each of the newly discovered gases condensed at temperatures higher than the boiling point of hydrogen but lower than 173 K. The last element to be liquefied was helium gas. First discovered in 1868 in the spectrum of the Sun and later on Earth (1885), helium has the lowest boiling point of any known substance. In 1908, Dutch physicist Heike Kamerlingh Onnes (1853–1926) finally succeeded in liquefying helium at a temperature of 4.2 K.
Cryogenic conditions are produced by one of four basic techniques: heat conduction, evaporative cooling, cooling by rapid expansion (the Joule-Thomson effect), and adiabatic demagnetization. The first two are well known in terms of everyday experience. The third is less well known but is commonly used in ordinary refrigeration and air conditioning units, as well as in cryogenic applications. The fourth process is used primarily in cryogenic applications and provides a means of approaching absolute zero. Heat conduction is a relatively simple concept to understand. When two bodies are in contact, heat flows from the body with the higher temperature to the body with a lower temperature. Conduction can occur between any and all forms of matter, whether gas, liquid, or solid. It is essential in the production of cryogenic temperatures and environments. For example, samples may be cooled to cryogenic temperatures by immersing them directly in a cryogenic liquid or by placing them in an atmosphere cooled by cryogenic refrigeration. In either case, the sample cools by conduction (or transfer) of heat to its colder surroundings. The second process for producing cryogenic conditions is evaporative cooling. Humans are familiar with this process because it is a mechanism by which our bodies lose heat. Atoms and molecules in the gaseous state are moving faster than atoms and molecules in the liquid state. Add heat energy to the particles in a liquid and they will become gaseous. Liquid perspiration on human skin behaves in this way. Perspiration absorbs body heat, becomes a gas, and evaporates from the skin. As a result of that heat loss, the body cools down. In cryogenics, a container of liquid is allowed to evaporate. Heat from within the liquid is used to convert particles at the surface of the liquid to gas. The gas is then pumped away. More heat from the liquid converts another surface layer of particles to the gaseous state, which is also pumped away. The longer this process continues, the more heat is removed from the liquid and the lower its temperature drops. Once some given temperature is reached, pumping continues at a reduced level in order to maintain the lower temperature. This method can be used to reduced the temperature of any liquid. For example, it can be used to reduce the temperature of liquid nitrogen to its freezing point or to lower the temperature of liquid helium to approximately 1 K.
A third process makes use of the Joule-Thomson effect, which was discovered by English physicist James Prescott Joule (1818–1889) and William Thomson, Lord Kelvin, in 1852. The Joule-Thomson effect depends on the relationship of volume (bulk or mass), pressure, and temperature in a gas. Change any one of these three variables, and at least one of the other two (or both) will also change. Joule and Thomson found, for example, that allowing a gas to expand very rapidly causes its temperature to drop dramatically. Reducing the pressure on a gas accomplishes the same effect. To cool a gas using the Joule-Thomson effect, the gas is first pumped into a container under high pressure. The container is fitted with a valve with a very small opening. When the valve is opened, the gas escapes from the container and expands quickly. At the same time, its temperature drops. The first great success for the Joule-Thomson effect in cryogenics was achieved by Kamerlingh Onnes in 1908 when he liquefied helium. The Joule-Thomson effect is an important part of our lives today, even though we may not be aware of it. Ordinary household refrigerators and air conditioners operate on this principle. First, a gas is pressurized and cooled to an intermediate temperature by contact with a colder gas or liquid. Then, the gas is expanded, and its temperature drops still further. The heat needed to keep this cycle operating comes from the inside of the refrigerator or the interior of a room, producing the desired cooling effect. The fourth process for producing cryogenic temperatures uses a phenomenon known as adiabatic demagnetization. Adiabatic demagnetization makes use of special substances known as paramagnetic salts. A paramagnetic salt consists of a very large collection of particles that act like tiny (atom-sized) magnets. Normally these magnetic particles are spread out in all possible directions. As a result, the salt itself is not magnetic. That condition changes when the salt is placed between the poles of a magnet. The magnetic field of the magnet causes all the tiny magnetic particles in the salt to line up in the same direction. The salt becomes magnetic, too. At this exact moment, however, suppose that the external magnet is taken away and the paramagnetic salt is placed within a liquid. Almost immediately, the tiny magnetic particles within the salt return to their random, every-which-way condition. To make this change, however, the particles require an input of energy. In this example, the energy is taken from the liquid into which the salt was placed. As the liquid gives up energy to the paramagnetic salt, its temperature drops. Adiabatic demagnetization has been used to produce some of the coldest temperatures ever observed—within a few thousandths of a degree kelvin of absolute zero. A related process involving the magnetization and demagnetization of atomic nuclei is known as nuclear demagnetization. With nuclear demagnetization, temperatures within a few millionths of a degree of absolute zero have been reached. Following his successful liquefaction of helium in 1908, Kamerlingh Onnes turned his attention to the study of properties of other materials at very low temperatures. The first property he investigated was the electrical resistance of metals. Electrical resistance is the tendency of a substance to prevent the flow of an electrical current through it. Scientists had long known that electrical resistance tends to decrease with decreasing temperature. They assumed that resistance would completely disappear at absolute zero. Research in this area had great practical importance. All electrical appliances (ovens, toasters, television sets, and radios, for example) operate with low efficiency because so much energy is wasted in overcoming electrical resistance. An appliance with no electrical resistance could operate at much less cost than existing appliances. What Onnes discovered, however, was that for some metals, electrical resistance drops to zero very suddenly at temperatures above absolute zero. The effect is called superconductivity and has some very important applications in today's world. For example, superconductors are used to make magnets for particle accelerators (devices used, among other things, to study subatomic particles such as electrons and protons) and for magnetic resonance imaging (MRI) systems (a diagnostic tool used in many hospitals). The discovery of superconductivity led other scientists to study a variety of material properties at cryogenic temperatures. Today, physicists, chemists, material scientists, and biologists study the properties of metals, as well as the properties of insulators, semiconductors, plastics, composites, and living tissue. Over the years, this research has resulted in the identification of a number of useful properties. One such property common to most materials that are subjected to extremely low temperatures is brittleness. The recycling industry takes advantage of this by immersing recyclables in liquid nitrogen, after which they are easily pulverized and separated for reprocessing. Still another cryogenic material property that is sometimes useful is that of thermal contraction. Materials shrink when cooled. To a point (about the temperature of liquid nitrogen), the colder a material gets the more it shrinks. An example is the use of liquid nitrogen in the assembly of some automobile engines. In order to get extremely tight fits when installing valve seats, for instance, the seats are cooled to liquid nitrogen temperatures, whereupon they contract and are easily inserted in the engine head. When they warm up, a perfect fit results. Cryogenic liquids are also used in the space program. For example, cryogenic materials are used to propel rockets into space. A tank of liquid hydrogen provides the fuel to be burned and a second tank of liquid oxygen is provided for combustion. Another space application of cryogenics is the use of liquid helium to cool orbiting infrared telescopes. Infrared telescopes detect objects in space not from the light they give off but from the infrared radiation (heat) they emit. However, the operation of the telescope itself also gives off heat. What can be done to prevent the instrument from being blinded by its own heat to the infrared radiation from stars? The answer is to cool parts of the telescope with liquid helium. At the temperature of liquid helium (1.8 K) the telescope can easily pick up infrared radiation of the stars, whose temperature is about 3 K.
Heating temp of 260 degrees masked to seperate body with friction but to only shield or ayura body to perserve and keep gases from friction within themselves. This is to perserve the people deqaling with ddeath threating diseases to al;low knowkledfge and advancvement to occur and percede when possible and not letting subject to pass intop next state. this article is really very helpful .It helps in my project .It clears whole concept of cryogenics. I really liked this website. I really liked it because I got to learn more about cryogenics. Good work and keep it up! really a good publish. it helped me a lot to write my final report on cryogenics. I am interested the use for medical purposes for humans with life threatening or serious medical reasons . What temperature would cause a mammoth to freeze while chewing grass?